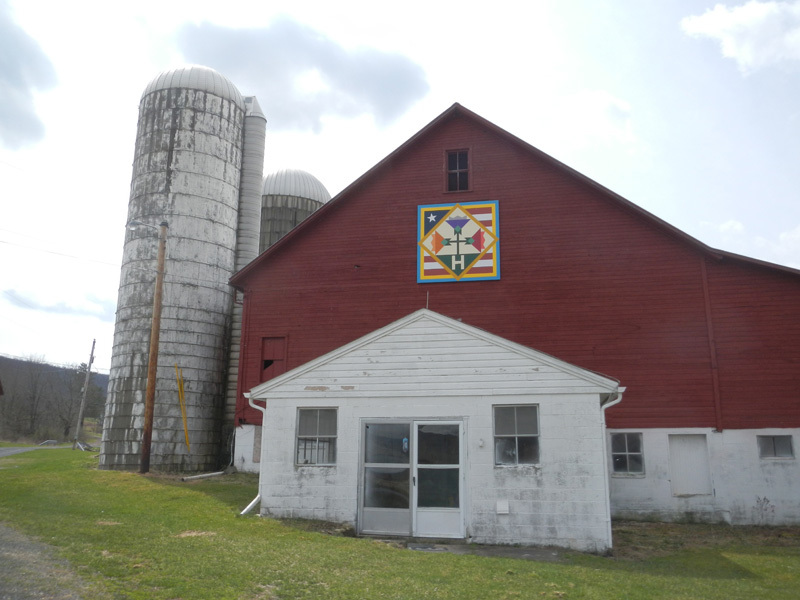 Our Barn Quilt Block centers itself on this family and our lives on the farm. The flowers growing from the "Hixson" soil represents the growth and expansion of our family heritage. What once was a small family, like a seed, has sprouted and blossomed into a multi-generation worldwide family. Even though the family has since grown in size, all of us know, remember and cherish our humble roots that started on this farm. Our Barn was built in the late 1800's by Wilson H. Williams. He was a skilled carpenter who contributed to the design and construction of several Bedford and Fulton County structures. Wilson is Mary Ann Hixson-Poet's Great, Great Grandfather. Through the years the Hixson Farm was a Dairy Farm raising Registered Black and White Holsteins and currently is a crop farm. The Hixson Farm has been "Home" to 7 generations of our family. The American Flag in the background not only represents our family's patriotism to this country, but also symbolizes how proud we are to honor our past and present family members who have served our nation. We are a homegrown family whose ideals, morals, values and faith still represent those of our earliest ancestors. This allows us, The Hixson Family, to be proud of our ever-growing Family Name.